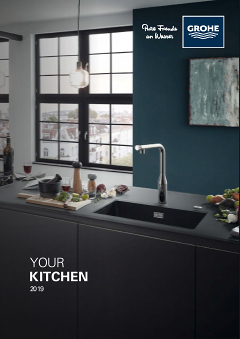 GROHE K7 delivers maximum kitchen style and convenience! Developed with professional chefs, it will spark your passion for cooking. Apart from its attractive design, you'll love its functional perfection. Its high spout is perfect for filling or rinsing even your tallest pots and it also swivels through 140° so you can fill several pots in succession. One convenient extra is its separate side spray with a powerful shower jet that allows you to clean tall pots or even the entire sink thanks to its extensive reach. Our easy installation system ensures a quick and hassle-free mounting of the tap. Finished in the GROHE StarLight chrome coating, it will retain its luminous sheen even after years of use. Mounted beside the tap, the side spray is your perfect kitchen helper, offering maximum flexibility for your kitchen work. With its powerful shower jet, you can easily rinse pots or clean the entire sink and work area.